Landscaping without grass is a growing trend for two reasons; not only does it provide a stunning, vibrant alternative to a boring, monochromatic grass lawn, it also requires much fewer resources to maintain. 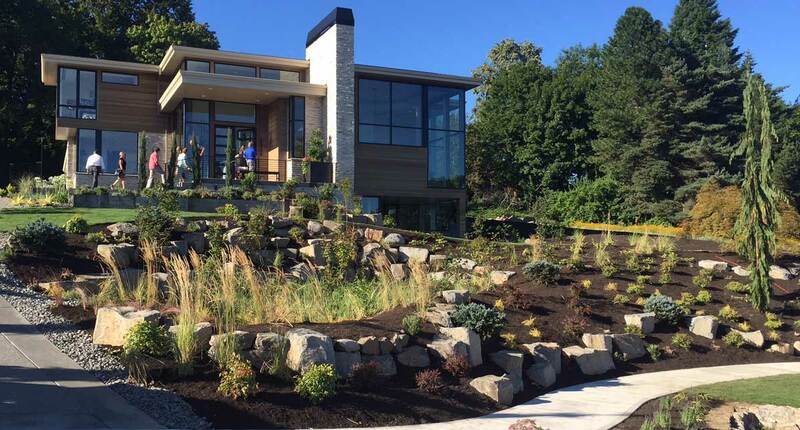 For these reasons, we were thrilled to work with Northwest Outdoor Living and Landscapes to create a tiered, low-water and low-maintenance design for the landscape surrounding our modern, inspired Joie de Vivre home for the NW Natural Street of Dreams. Joie De Vivre features a sleek, contemporary exterior design with large windows in place of what would traditionally feature closed-off walls. Another element of the modern exterior is its light, earth toned color palette, which gives the home a more natural feel than most. 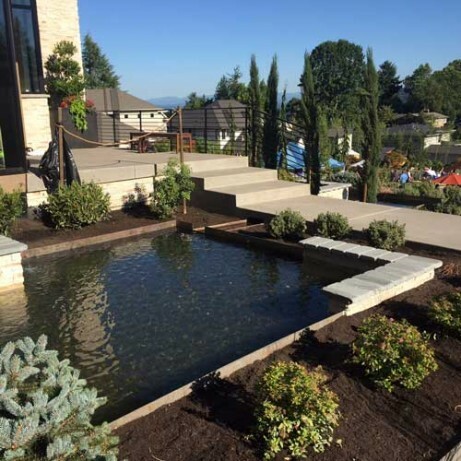 In keeping with the home’s organic aesthetic, Northwest Outdoor Living and Landscapes planted a variety of low shrubs, small trees and bright green grasses in intentionally placed groups. This landscape design is exceptionally tidy looking, with a 21st-century feel. What’s more, we’re confident it allows the future homeowners to truly embrace the Joie de Vivre of this home, as its landscaping will require very little upkeep and no excessive watering to keep it looking beautiful for years to come. 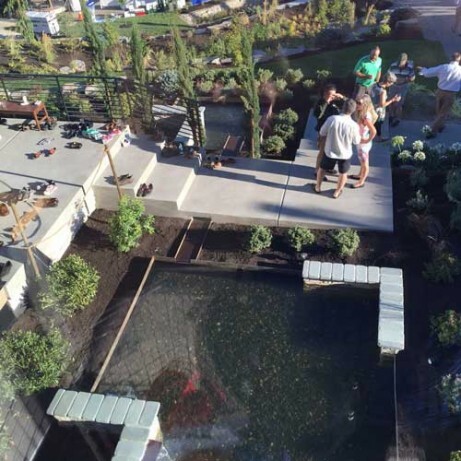 Our collaboration with Northwest Outdoor Living and Landscapes, which boasts over 25 years of experience in the landscape industry, enabled us to create the ideal landscape design for this truly unique home. For us, that meant matching the aesthetic style of the home with a landscape design that includes a robust array verdant grasses with a tiered structure, along with a sculptural metal and rock water feature right up front that creates an atmosphere of serenity and, of course, joie de vivre, before the front door is even opened.